Lately, it would seem, babies have been popping out all over the place. Social networking keeps me updated of their arrivals and progress -- often in minute-by-minute minute detail. (As one sympathetic friend pointed out, at least it means people have stopped posting pictures of their food). I marvel that so many should so willingly and intentionally engage with the act of initiating life. I've always found life rather complicated, myself, and not without its difficulties, even given the fact that I have stupid amounts to be grateful for and extremely little (in the grand scheme of things etc etc) to complain about. And though I do recognise and (try to) trust God's perfect judgment and right and grace and love in 'bringing into existence', there are days when it feels rather burdensome nonetheless, and it's hard to imagine being entirely comfortable with the idea of playing a proactive role in inflicting it on someone else (especially as that someone would have quite a number of my evidently problematic genes). My parents neatly escaped any embittered accusation I might have thrown at them by having me accidentally . Though married, they hadn't planned on expanding the family. But they welcomed me with all the love, generosity and willingness that I've seen them extend in smaller part to many an unexpected guest since. (And me, of course, being the wonderful, adorable small person that I was, they promptly had two more, on purpose this time). I am so grateful to them -- not just for accepting and caring for me with characteristic self-sacrifice and grace, but for leaving me no room to view myself as some sort of pet project, or personal life goal number X, or purpose-imbuing distraction from the void of dissatisfaction and meaninglessness (just a taster of how foolish and ridiculous I can become in 'embittered accusation' mode). Instead, if God wanted me to be, in spite of my parents a priori indifference, who am I to complain about that? Anyway...other people seem quite happy to procreate, and I suspect I would be wise to learn to acknowledge this as good. Much as I am taken to questioning things other people take for granted (carefully avoiding those which, for my convenience, I'd like to carry on taking for granted too), I don't expect I'd quite get away with questioning babies. Nor do I want to really: I met one recently -- well more of a toddler I guess but that seems a reliable indicator that he was probably a baby in the very near past -- who was so unbelievably, impossibly adorable, and who showed me such undeserved grace (mostly via the act of 'sharing his toy cars'), that he succeeded in softening even my characteristically terrified stiffness. 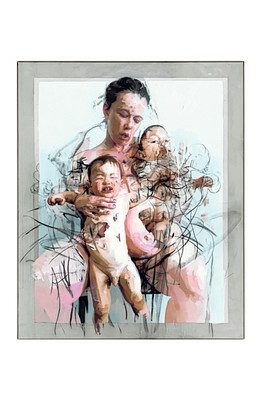 I was also reminded of the wonder and power of new life by a Jenny Saville exhibition we saw in Oxford. Upstairs was all death and brutality. Downstairs was some work she'd done since becoming a mum [example], mirroring classical 'madonnas' and full of vitality and beauty. There was a slightly violent, vicious element to them -- exploring, perhaps, the domineering demands of child over parent (a necessary reality?) -- but they were still celebratory and affirmed the essential lovingness of those relationships. I was moved to see how profoundly her work had been affected by the experience. "When a woman is giving birth, she has sorrow because her hour has come, but when she has delivered the baby, she no longer remembers the anguish, for joy that a human being has been born into the world." (John 16:21) (An analogy, given by Jesus, for the struggles and joy that lay ahead for his followers). For me, though, motherhood remains a tricky subject (not to say we've ruled anything out, but, well, it's complicated), and it's started to look conspicuous alongside our peers, to the point where we've recently taken to briefing one another on the way to dinner parties (etc), on how best to answer "that question". I suspect there are those among my acquaintance who would have strong words to say against the intentionally childless marriage -- not just my Catholic friends either. I could probably legitimately play the 'health' card if I wanted to; preferable, I expect, to entertaining any further my 'theology of it being specifically better to not have babies' (mostly based on highly selective parts of 1 Corinthians 7) which even I can see is probably pure rationalisation, an attempt to adapt my beliefs to suit my behaviour. Maybe there is something in this passage though, which answers a little to part of our predicament -- the part, at least, about living in harmony with people whose life expectations and experiences are different to our own. I'm cautious about taking it out of context as Paul never explicitly mentions parenthood -- but he does seem keen to stress that there is no 'one size fits all' pattern for life, but that each of us should "lead the life that the Lord has assigned to him, and to which God has called him" (v17). I think, within the family that is the church, we often want everyone to conform to our own ideals and pattern for life. Sometimes this is because we are unsettled by anything that is outside of our own experience, but it can also be a natural product of genuine (albeit short-sighted) love -- we naturally desire what is best for our brothers and sisters, without considering that this might look very different to what we understand as best for us. Paul recognises and corrects this tendency in himself, at the same time celebrating the healthy diversity that is to be found within the unity of the church: "Now as a concession, not a command, I say this. I wish that all were as I myself am. But each has his own gift from God, one of one kind and one of another." (v 6-7) I may find reassurance in this, that it's 'ok to be me', but there's also at least two challenges: to learn to 'be me' in the unique, God-honouring way that He intends (rather than using the excuse of individuality to entrench myself in the worst of my 'quirks'), and to learn to support and encourage other people to 'be themselves' similarly. Well, more accurately, Laurence Sterne, creator of said protagonist. But once you've journeyed through the book (for me, an experience of hard-won hilarity) it's easy to forget that Tristram isn't/wasn't a real person...Check it out -- it's plenty old enough to be free. I did obtain permission before publishing this information...got the text message to prove it and everything. (Not that I'd have been at any risk of being found out...I mean, you'd think one's own parents would at least pretend to take an interest in one's creative endeavours..."It's just, well, you write at great length, dear, and I don't really understand about what". Hmm; not entirely dissimilar to the reviewer comments on my latest rejected paper...).